There’s a lot of truth in those words. And it applies to many things in our lives, including the ability to stay in our homes for as long as possible as we age. Universal design applies to all aspects of your home. But in many cases, it begins with your floors. Flooring has to allow accessibility inside and out, through all rooms and doors. While it’s important to keep stairs at a minimum, it’s equally important to ensure what stairs there are easy to access and slip-free. 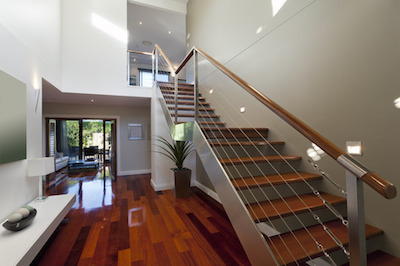 Hardwoods can be slippery – carpet runners can add softness and ensure they are easier to climb. Ensure they are installed correctly to avoid tripping hazards. Any obstruction, no matter how tiny it is, can be difficult for some people. Roll-in showers with no curb gives anyone the ability to walk in and have more surface area to create ambiance and appeal. If you build the shower large enough, you can slope tiles towards the drain to give water easy access to the drain, and help keep your bathroom easily maintained. There are many products that can offer you everything you need in flooring material. When using tiles, smaller tiles provide less surface slipping. Cork flooring adds a little cushion and warmth underfoot. Carpeting is still a great choice for cushion, softness to prevent hard falls. Just ensure that all materials are properly installed and don’t pose a tripping hazard when walking between rooms. Have you considered what flooring you’ll use in your universal design remodel?